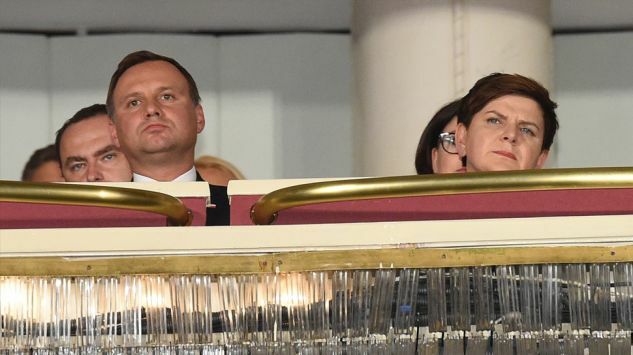 President Duda is a career oriented man who chose PiS and right wing side to get to the top. He comes from a good catholic family, his parents are academic teachers, brought up their son in patriotic atmosphere. His wife`s, Agata, family declare leftist views although they used to be in anticommunist opposition and her father was arrested during martial law. She is said to share these views, too, but doesn`t declare anything openly in order not to cause controversy. She was by her ambitious husband`s side during the campaign and greatly contributed to his victory. Today, she still supports him and cares about his career, e.g., remains silent about new plans to make abortion illegal although women movements asked her to defend their rights. Only sometimes she has enough and decides to act independently. E.g., the premiere of PiS propaganda film about the plane crash in Russia attracted top PiS officials and their followers. However, President came alone, because his wife took their daughter to latest Woody Allen film in another cinema. Moreover, body language experts who observe the couple during public appearances noticed certain emotional cold between them. Any fond gestures, if they happen, look artificial and arranged. Body language doesnt` lie, sort of. Famous "Go and kiss her" was whispered to Mr President by Mrs Prime Minister during a rally. Besides, the couple finished two different Krakow high schools which have always been rivals. Yes, I corroborate, I went to Ist High School and we didn`t like those who went to IInd because we considered ourselves better as our school was the oldest in Poland. Kings attended it! So you understand easily why we didn`t want to be compared to some plebeian guys from 2nd High School. Yes, I am quite impressed with the credentials of your high school! Of course as teenagers and students you needed to flaunt that great history and reputation! Yes, we considered ourselves the elite, even though we lived in communism where everybody is supposed to be equal. But you should understand that some were more equal than others. (la) Si Deus nobiscum, quis contra nos? (en) If God be with us, who is against us? it reminds me of German Gott mit uns, it is so pretencious. Our motto was Semper in altum, always higher. I have kept to this motto till today and I must say there are very few people who have achieved my heights. I don't think using a line from scripture (Romans 8:31) for a motto is being pretentious...perhaps they were showing their strong faith...and isn't that a very Polish thing to do? Oosp, I didn`t get so far in the Bible. I used to skip those Romans because I associated them with those barbarians who massacred Christians etc. I didn`t want to read about their cruelties, I read Quo Vadis and that was enough. But the Polish saying goes: If you must fall, try to fall from the tallest horse. It seems the couple has been sort of united by opposition pressure. Everywhere they appear, the democratic opposition members come too and remind about the Constitution, Democracy etc. They are really intrusive and the presidential couple seem to have a problem with it, they are visibly fed up and sometimes do silly things. I am sorry but despite being Christian, I can`t feel sorry for them. They simply suffer the consequences of their own deeds. Booing, sirens and whistles during a high school speech. President is nervous.